And just like that, I’m standing at Everest Base Camp. The joy I feel when I arrive, you would have thought there was some red carpet rolled out adorned with gold petals and an all-you-can-eat chocolate buffet at the end. 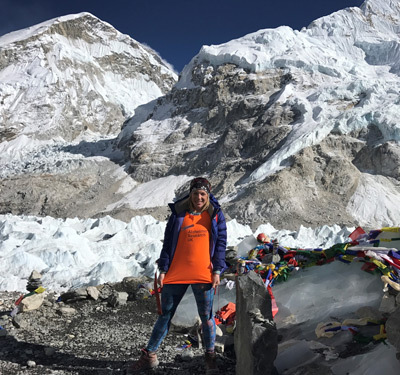 In fact, it’s simply a platform of graffitied rocks, some trampled on prayer flags, the odd can of Everest Beer and a little bit of ice to give you that last challenge to negotiate as you step up for your obligatory photo. Despite it being aesthetically underwhelming, I, alongside many other trekkers, don’t really care. It’s not about this one moment, it’s not even about the eight long days it’s taken to get here. It’s about the whole journey since we signed up all those months ago and as we arrive, you can’t help but feel overwhelmed with mixed emotions. I feel overjoyed to be here, I’m tired, I want to call my friends and family, I want to hug everyone, I want a hot shower and then I feel that pang of sadness that it’s almost over. The trek to Everest Base Camp was the last in a series of challenges that raised more than £4,000 for Alzheimer’s Research UK, including competing in the Middle Distance Triathlon European Championships in Denmark and City to Summit, a 150-mile duathlon from Edinburgh to the top of Ben Nevis. I was inspired to raise money for the charity as both my nans died with dementia. This “Year of Challenges” has been the most incredible journey and now it’s done I can’t help but feel a little lost. The funny thing is, when people back home ask “So…how was it? !”, I simply don’t know how to answer. How do I summarise everything in just a few mediocre sentences? I could talk about the sheer beauty of the Himalayas – the snow-capped mountains and rich green forests with that milky blue river dancing through the centre to make each photo look like a postcard. I could talk about a culture so rich in history, in values, in community and kindness but so poor in all the material things I head home to, and debate which I’d rather have. Maybe talk about the food, which was hard to stomach some days but you forced down through fear of not fuelling your body enough to make it to the end goal. Those bitter cabbage momos will forever haunt me but not as much as witnessing local porters carrying back-breaking amounts of food over miles of terrain just to earn a modest living. Maybe the moment you went from being ultra vigilant to avoid stepping in yak dung to walking right through it and letting it trail off the back of your shoe without a care in the world. 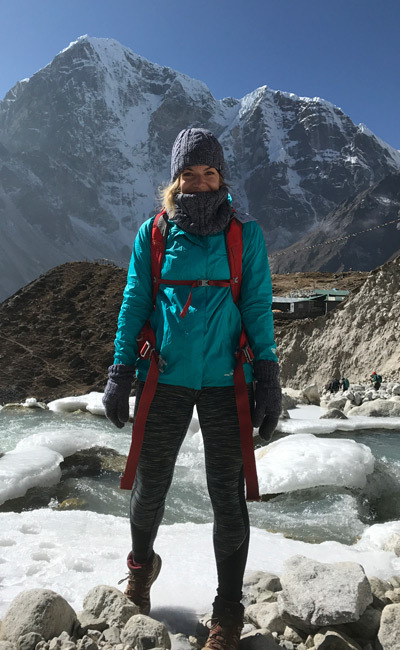 Everest Base Camp was the last adventure in my “Year of Challenges” and although physically I didn’t find it as tough as some of the other things I’ve done, I think it taught me the most about the power of people. I had the privilege of meeting some incredible humans, both those on the trek and the relentlessly hard-working Sherpas who looked after us every step of the way. Every other event this year has been incredibly isolated. In City to Summit I barely saw another living soul over the 150 miles of running and cycling apart from the few pit-stops I huddled in for just enough time to cram some sugar in my belly. For 18 hours, I put my head down and raced as hard and fast as I could. That’s not to say I didn’t love it, I’d do it again in a heartbeat, but Base Camp taught me the value of slowing down and appreciating the view. It taught me to listen to other people’s stories and to be inspired by more than stats or a PB. For most of the year I’ve been stuck in my own head building up a resilience to pain and exhaustion. It’s what I love doing and it’s what I’ll continue to do for as long as my body lets me. But during those days in Nepal I remembered what it’s like to be part of a team with a united goal and how powerful that can be. When morale is low it doesn’t have to be a battle in your head, it can be a hug from someone you’ve only known a few days or a joke or game of cards over a lemon tea. I could ramble some profound nonsense about how the trip has forever changed me, that I no longer place value on any of the luxury items I have back at home, but that would be a lie. All I can hope is that these memories will stay with me for a lifetime and when I look at all I have, I won’t want anything more. I will instead be humbled by how truly happy you can be when you look no further than the beauty in everything and everyone around you. My footprints will be long gone on that trail by now and the mountains will never remember I was there. But for me, I’ll never forget. You can sponsor Laura at www.justgiving.com/fundraising/Laura-Psycle. If you’ve been inspired by Laura’s story and would like to take on a trek or sporting event for Alzheimer’s Research UK, you can find out more information here.